The third plate from The Mirror of the Graces; or the English lady's costume is of two evening dresses. “The first figure in a round robe of white crape, ornamented at the feet with a flounce of Mechlin lace: an horizontal striped front, composed of alternate lace and needlework: short sleeve to correspond: the robe extended over a slip of gossamer satin, either white, blossom-colour, or blue: the hair in curls confined, and ornamented with a bandeau and rose-diadem of pearls, diamonds, or coloured gems; ear-rings, neck-chain and bracelets to correspond: French watch and chain, with a cluster of small variegated emblematic seals: ivory fan, with mount of silver frosted crape: white satin slippers, with silver clasps or rosettes: and white gloves of French kid." 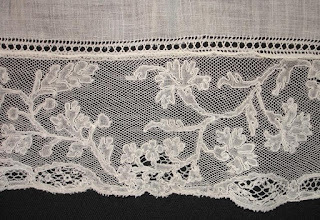 Mechlin lace originated in Flanders and was traditionally made by hand using a system of bobbins to organise the threads being woven together. 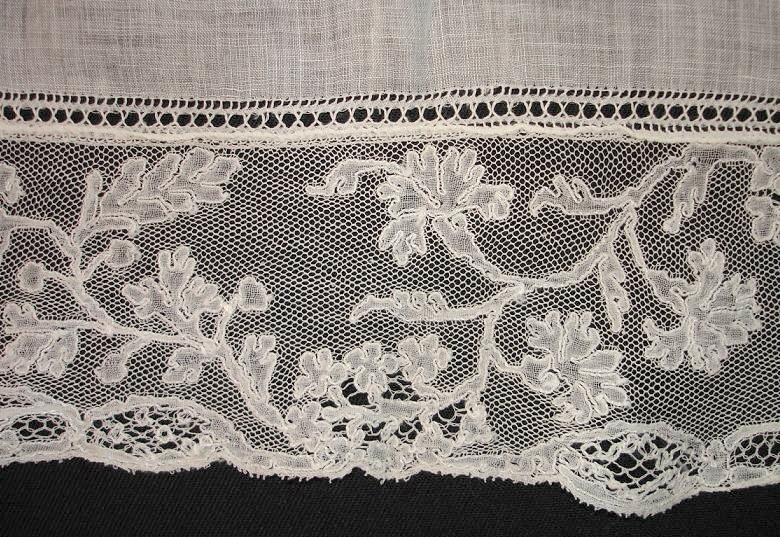 It is a very fine lace with a transparent appearance, particularly known for its floral patterns and outlined designs. 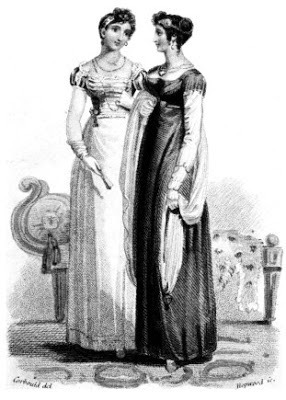 It was particularly suitable for trimming garments, such as the evening dress described above. It was sometimes used for gathered trimmings called quillings. Folding fans were popular fashion accessories throughout the Georgian period and were made all over Europe as well as being imported from the Far East by the East India Company. A folding fan consists of sticks which are joined at the base by a rivet which forms a pivot for the fan to be opened or closed. These sticks are then covered with a pleated leaf which is painted or printed with a design. The outer sticks are called guards and together with the rest of the sticks, they are called montures. During the Georgian period, the montures were made from materials such as ivory, mother of pearl and tortoiseshell, and were often carved and decorated with precious metals and stones. The smaller brisé fan was particularly fashionable during the late Georgian and Regency periods. The brisé fan has wider sticks that overlap when open and are joined at the top by a ribbon or thread creating an effect similar to the pleated leaf of the folding fan. Read more about Regency fashion from the The Mirror of the Graces - Regency promenade dresses and Regency morning gowns. Picture of Mechlin lace by Carolus and used under a Creative Commons License. 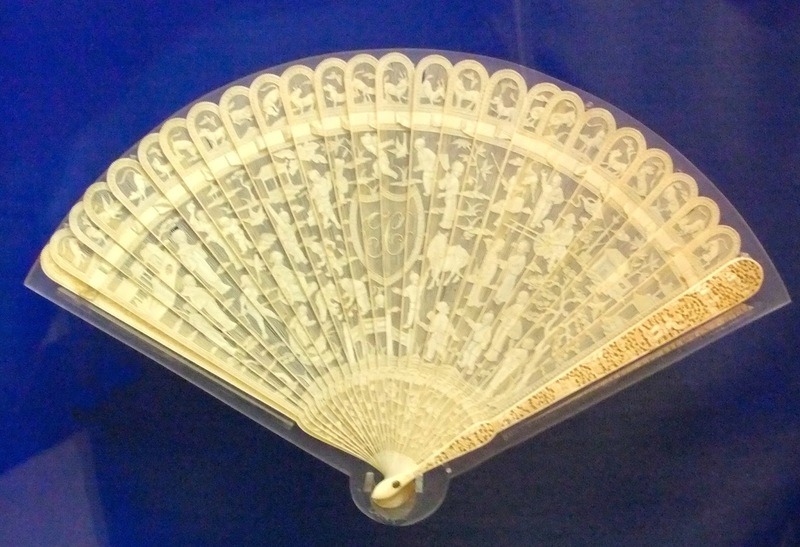 Picture of carved ivory fan from the Museum of Liverpool by Reptonix under a Creative Commons license. The second plate from The Mirror of the Graces; or the English lady's costume is of two carriage or promenade dresses and is accompanied by a full description. “The second plate represents two figures in carriage or promenade costumes. The most prominent appears in a long pelisse, à la militaire, which is composed of purple or grey twill sarsnet, or of grass green velvet: an arched collar trimmed with Spanish braiding: the front of the bust ornamented with three rows of silk frogs the colour of the pelisse: arched military cuffs to correspond. The coat confined in the centre of the throat, and at the bottom of the waist, with a brooch and clasps of mother-of-pearl set in gold: a convent mob cap of Paris-net confined under the chin, and ornamented in front with a full flower blended with the curls of the hair; its colours tastefully contrasted with that of the pelisse: half boots or Roman shoes, of purple or buff kid: gloves, a pale lemon colour." A frog is a decorative braiding used to embellish a garment at the same time as fastening it closed by means of a button and loop. "The ridicule, when used, should be composed of the same materials as the coat, fixed into a gold lion snap. It is necessary, however, to observe, that this article (though exceedingly convenient, since fashion has excluded the use of the pocket) is considerably on the decline with females of a superior order; but as we hear of no substitute, it can never be completely banished till the fashion of the pocket is revived." A ridicule or reticule was a lady’s purse. It was designed to carry around personal items that used to be kept in a pocket underneath a lady’s skirts. A pocket was a flat bag, tied around the waist, completely separate from the dress, and reached by means of a slit in the side seam of the skirt. Pockets fell out of favour in the early 19th century when fashions became more streamlined and it was no longer possible to hide a bulky bag under your skirts. 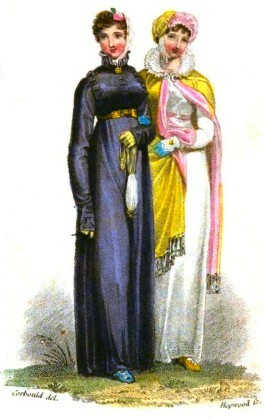 Ridicules came into fashion enabling ladies to carry around their belongings without spoiling the line of their dresses. The above description suggests that ridicules were on their way out, but in this instance, convenience seems to have outweighed the fashionable notions of “superior” ladies and ridicules remained in fashion. Limerick gloves were named after County Limerick in Ireland where they were first made and were a popular daytime accessory during the Regency period. Although often referred to as 'chicken skin' gloves, they were actually made from the skins of unborn calves. They were usually cream or yellow in colour and were renowned for their superior quality and thinness. 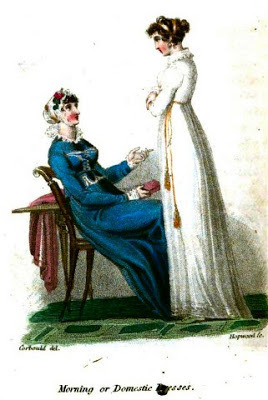 Read about Regency morning gowns in The Mirror of the Graces. John Constable (11 June 1776 - 31 March 1837) was an English Romantic painter famous for his landscapes, including many based on the area around his home in Suffolk, now known as “Constable Country”. His most famous works include The Hay Wain, Dedham Vale and View of Salisbury Cathedral. Constable was born in East Bergholt in Suffolk on 11 June 1776. He was the second son of Golding Constable, a gentleman farmer and mill owner, and his wife Ann. He left boarding school after being badly bullied and became a day pupil at Dedham grammar school where the headmaster, Reverend Grimwood, encouraged his early interest in painting. Already desirous of becoming an artist, Constable fought against his family’s desire for him to enter the church. However, when it became clear that his elder brother, who had learning difficulties, would be unable to take over from his father, Constable accepted his duty and entered the family business. In his spare time, Constable continued to paint and draw, advised by his friend and fellow painter, John Dunthorne, a local plumber whose son later became his studio assistant. In 1795, Constable’s mother gained him a valuable introduction to Sir George Beaumont and a year later he met two other artists, John Cranch and JT "Antiquity" Smith, who were able to give him practical drawing instruction. When his younger brother Abram was old enough to take over his role in the family business, Constable was free to go to London to study art. 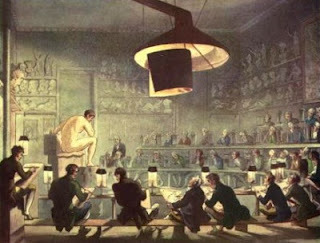 On 4 February 1799 (1), he was admitted as a student at the Royal Academy, firstly to study antiquities and later life studies. Although Constable started exhibiting at the Royal Academy in 1802, his work was criticised for its poor finish or “unfinished handling”; he was not elected an associate until November 1819, and was only made a full member on 10 February 1829. 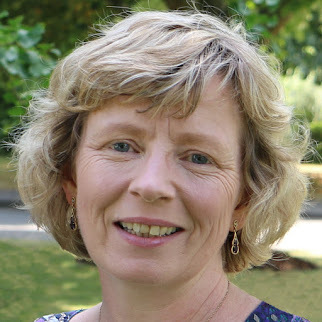 Constable was fortunate to have supportive friends offering both patronage and advice. Joseph Farington was an influential member of the Royal Academy who, along with Sir George Beaumont, gave him access to old masters, which he copied to develop his powers of execution. Another valuable friend was Dr John Fisher, who became Bishop of Salisbury and chaplain to the Royal Academy, and whose nephew John Fisher became Constable’s best friend. Constable was a prolific artist, producing lots of sketches from which he painted landscapes, including a number of large-scale paintings which he referred to as his “six-footers”. Unfortunately his devotion to landscapes was not financially rewarding. He was forced to paint portraits to earn money and his parents, who were still subsidising his studies in 1809, urged him to follow this more lucrative path. Despite suffering from depression and bouts of illness, Constable worked tirelessly, developing his style of landscape painting and filling his studio with pictures of Dedham Vale. Constable fell in love with Maria Bicknell and when she came of age in 1809, the couple declared their mutual affection. But they met with stern resistance from Maria’s family, in particular, from Maria’s maternal grandfather, Dr Rhudde, who threatened to disinherit Maria’s family if she married Constable. Constable was determined to prove himself and gain financial security. However, it was not until he received an inheritance on the death of his father that Constable was finally able to marry. Constable and Maria were married on 2 October 1816 at St Martin’s Church, London. 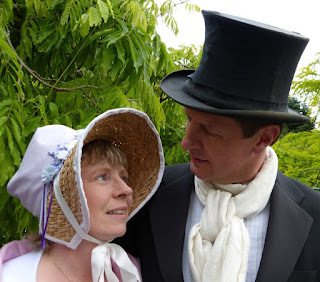 The ceremony was conducted by John Fisher who invited the Constables to spend their honeymoon at his vicarage in Osmington, near Weymouth, in Dorset. Constable was devoted to his wife and their seven children, but Maria’s health proved to be a constant source of concern. In August 1819, he rented a cottage in Hampstead to enable his family to escape from the bad air of London and they later moved there permanently. Constable split his time between his London studio and his family home. 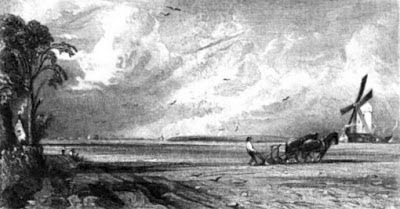 In 1820, Constable visited his friend Fisher, now a canon in Salisbury, and in 1824, he took his family to Brighton so that Maria could benefit from the sea air. But Maria’s consumption worsened and she died of tuberculosis on 23 November 1828, leaving Constable heartbroken and with seven children under the age of eleven to look after. Constable had sold very little of what he had exhibited, but in 1818, he sold two paintings and started to be noticed by the reviewers. But praise was not universal. Although his work was appreciated for its power, it was often criticised for its surface texture, which was accused of being like “chopped hay and whitewash” and a certain spottiness - "Constable's snow"(2). Constable received more widespread success in France. 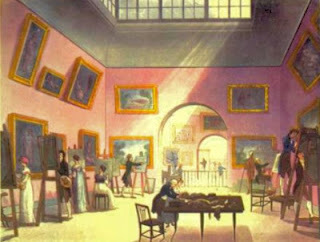 He exhibited at the Paris Salon in 1824 and was awarded a gold medal by Charles X and won another in Lille in 1826. Constable commissioned David Lucas to engrave several of his paintings and sketches and was intimately involved in their preparation before their publication in 1830-2. In the last years of his life, Constable gave various lectures including a series at the Royal Institution on the history of landscape painting in May to June 1836. 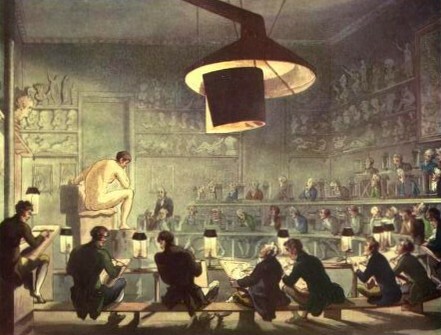 He was elected a member of both the Royal Institution and the Graphic Society in 1836. 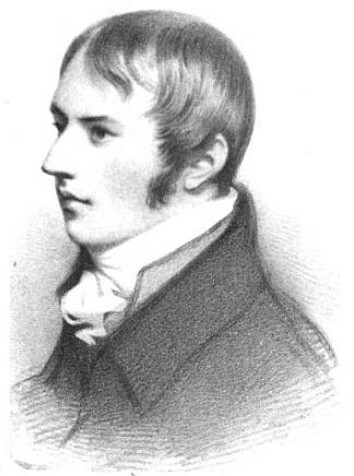 Constable suddenly became ill on 31 March 1837 with sickness and giddiness and died that night. (3) The exact cause of his death is unknown. He was buried in the churchyard of St John’s, Hampstead, next to his wife, leaving an estate valued at £25,000 to his seven children who were all under age. Read about another Regency era painter - Sir Thomas Lawrence. 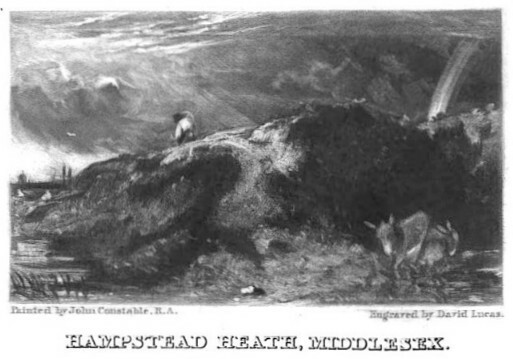 (1) From Memoirs of the Life of John Constable by CR Leslie (1845). (2) From the Oxford Dictionary of National Biography entry for John Constable by Judy Crosby Ivy (see below). (3) The Oxford Dictionary of National Biography states that Constable died in the early hours of 1 April, but all other sources state the date of death as 31 March. I recently discovered The Mirror of the Graces; or the English lady's costume by "a lady of distinction who has witnessed and attentively studied what is esteemed truly graceful and elegant amongst the most refined Nations of Europe". It was published in 1811, at the start of the Regency period. "The first plate represents two ladies in morning or domestic habits. The sitting figure is arrayed in a Flemish jacket and petticoat, of cerulean blue muslin, poplin or Chinese silk, laced up the front of the bust with white silk cord; and the jacket trimmed in narrow vandykes (1) to correspond. An antique frill and cuffs of white lace: a Parisian mob cap of thread lace and beading, ornamented with an appropriate flower in front: half boots of amber colour or buff kid: gloves, a pale tan-colour: an occasional scarf of mohair or Cashmire. The erect figure is represented in a round high dress of white muslin, ornamented at the feet with a coloured border of laurel leaves, in tambour or embroidery: a square falling collar, trimmed with lace, and Spanish cuffs to correspond: a large emerald or gold brooch confining the dress in the centre of the throat: a rich Turkish cord and tassel ornament the bottom of the waist, and fall in irregular lengths on the left side of the figure. The hair, in dishevelled curls in front, twisted in an Indian knot behind, and confined with bands of twisted silk or muslin, corresponding with the colour of the cord and tassel which embrace the bottom of the waist: Roman shoes, and gloves of the same shade." (1) A vandyke is a v-shaped point that is part of a decorative border or edging. Its name derives from the Flemish painter, Sir Anthony Vandyke, who sported a short pointed beard.